Amateur gardeners have neglected some of the best climbers that are grown quickly in almost any climate. One that is seldom seen, in spite of the fact that it was introduced into our country from Japan 100 years ago, is the climbing hydrangea. It bears splendid tresses of white flowers in July and August, and as it clings readily to rough surfaces it is especially suited for rustic arbors. It is hardy, but thrives best where the Winters are not too severe. Polygonum aubertii is a very fast-growing vine that late in Summer bears a great cloud of fleecy white flowers. It serves well for porches and trellises. Although Actinidia is well known, it is rarely seen except in the hands of professional gardeners who have learned its value in forming dense screens. It is especially well suited for covering lattice work, in order to produce a screen, and for growing on porches where seclusion is desired. The fact that insects almost never bother this vine offsets the lack of large flowers. Akebia quinata needs more sun than the ones mentioned above but, like it, is exceptionally free from insects and excellent to use where you do not desire a dense screen. It grows gracefully on arbors and porches. All who grow this pretty vine will be pleased. There is always a strong desire for a climbing vine that is evergreen in the middle and northern states. Euonymus fortunei vegetus, or evergreen bittersweet, answers that description. However cold the weather may be, the leaves are as green in February and March as they are in June. It produces great numbers of yellowish-red berries that last through the Winter. This vine does not grow rapidly until it has been planted two or three years, but after that it is a rapid grower. It is especially attractive when grown on walls or supports that suggest walls; it also looks well on arbors, and can be used to great advantage in covering ugly sites, or on new grounds. Sometimes it is used for edging and, where box is not available, for making miniature hedges in place of it. Here it must be trained. Many know about the Japanese ivy, which is like the common Boston ivy except that the leaf is smaller, and much more finely divided. It is the equal of the Boston ivy in its ability to cling to the smoothest surfaces, and really grows more readily. Its light green foliage turns red in late Autumn and lasts long in the Winter. Newer than any of the vines just mentioned is a wonderful clematis known as Clematis montana rubens. It was originally brought from China. It has rosy-red flowers that somewhat resemble the Japanese anemone. It begins to bloom in June and continues through the Summer. Do you know the cardinal climber? It is an annual that all should know. It has bright scarlet flowers that resemble small morning glories. 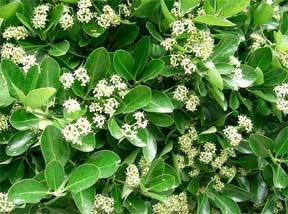 It is also rapid in growth and very attractive as the leaves are dark green and finely cut. The cardinal climber likes a sunny, open position, and is best started in the house; the plants may be transplanted in the open when about three inches high.